Get the music score for free! Like many music history stories this one probably has at least some elements of truth in it. It does seem that there was a movement in the church for greater textural clarity. 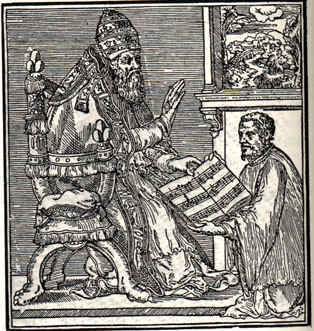 During his three weeks as pontiff, Pope Marcellus (for whom this mass may well have been written) did indeed express his desires that the words should be clearly understood. And we have the mass itself as evidence. The two movements which would have been at issue – because of their long texts – the Gloria and the Credo – most certainly do set forth the Latin words in the most clear manner imaginable. But to say he “saved music”. It has been the tradition to characterize Palestrina as a conservative composer, primarily because one does not find in his music some of the mannerisms of late Renaissance composers, for example chromaticism or figurations. But I think this is an erroneous evaluation, and I expect the scholarly writings on Palestrina will change in the coming years. There are three aspects of his music which actually point forward to the baroque: his use of harmony, rhythm, and his use of contrasting groups or blocks of sonority. We’ve already discussed the last aspect. The Gloria and Credo also provide perfect examples of modern use of harmony and rhythm. Throughout the Middle Ages and the Renaissance – in broadest generalities – the harmonic language of sacred choral compositions was modal. 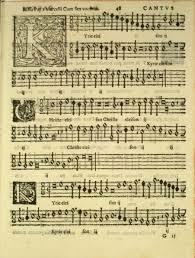 In the baroque period a tonal language of harmony was gradually developed. This is the major-minor, tonic-dominant harmonic language of most of Western music composed between 1600-1900, roughly. Most of Palestrina’s music was still written under the spell of the church modes. But much of this mass has a definite tonal feel, including dominant-tonic relationships. Likewise, this particular Gloria and this particular Credo are not written with the normal arsis and thesis (rise and fall) rhythmic feeling of most Renaissance choral music. Except for certain sections in the older style, most of these two movements have a genuine feeling of meter (regular strong and weak beats – another baroque aspect), even syncopations (accented off-beats). After years of working with this music, I feel there is a completely different internal rhythm in these movements – a livelier rhythm which is married perfectly with the natural declamation of the Latin words. Perhaps you will agree!